This is not a toy but a fully functional safety helmet. 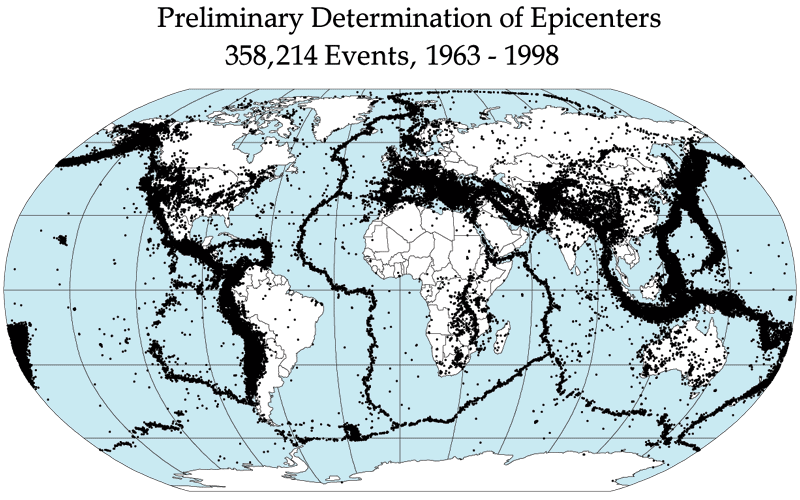 In Japan, earthquakes are unavoidable due to its geological location. 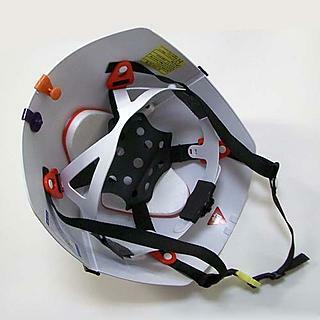 The hazard helmet to guard the head from falling objects is perceived as one of the most important earthquake safety item in every office and every home. However, storing a normal helmet takes too much space and consumers are not accustomed to keep a hazard helmet within reach. 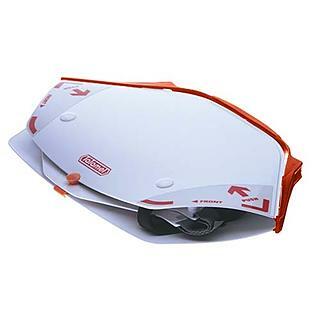 Tatamet is designed to resolve this issue by folding into a thin triangle for storage and popping out to become a helmet in one quick action. Its design and function have been approved by the Ministry of Health, Labour and Welfare as a hazard helmet for 'flying and falling objects'. The ground continued to rumble in Kobe, the western city that took the brunt of 17 January quake that killed more than 5,000 people. An aftershock of 4.7 set buildings swaying and sent new fears through a community wondering when its nightmare will end. There were no reports of damage or casualties but high-speed trains in the area were halted and several expressways were closed as a precaution. Over a week after the quake, about one-fifth of Kobe's population – 307,000 people – remained in tents and makeshift shelters set up in schools and government buildings. As of Wednesday, the death toll from the quake stood at 5074, with 61 missing and 26,618 injured. Nearly 75,000 buildings were damaged or destroyed. In an effort to ease the general misery, Japanese troops erected several temporary public baths around the city, giving thousands of people their first opportunity to bathe since the quake. In the case of the great earthquake of Tokyo (M.8), an announcement could be provided 50 seconds before the arrival of the main tremor. However, in the areas that are close to the center of the earthquake, the warning may not be transmitted before strong tremors occur. How the EEWS is working? Earthquake Early Warnings will be provided through various media outlets such as TV and radio. Private companies may be able to receive the announcement directly from the Japan Meteorological Agency. Individuals could get direct information through a special device. Mobile phone: Docomo should put on the market special mobile phone designed to receive AMJ alerts from late 2007; AU and Softbank from 2008. Before a helmet can be Snell-certified, it is tested in Snell's state-of-the-art test facility. 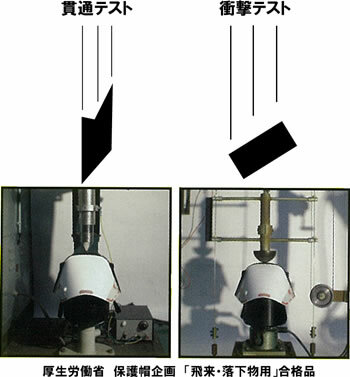 […] This test involves a series of controlled impacts where a helmet is positioned on a metal head form and then dropped in a guided fall onto various steel test anvils (Flat, Hemisphere, Kurbstone, Roll bar, edge or a horseshoe type) which simulate different impact surfaces. The head forms are instrumented with an accelerometer to measure peak G force or acceleration which is measured in "G"ravitational units. The impact energy (drop height and mass), or how hard the helmets are impacted is unique to each standard. However, if in any valid test the peak acceleration imparted to the head form exceeds 300 G's, the helmet is rejected. The maximum tolerable deceleration, of the human head is approximately 300 g, provided it is applied for a few milliseconds only. Longer impacts at this deceleration level cause irreversible injury. The mass (m) of a head is approximately 3 kg, so the maximum allowable force, from Newton's Law, is F = m a = 9 kN. As the foam crushes between the obstacle (on the outside) and the skull (on the inside) it beds-down, distributing the load over a projected area A of order 10-2m2. To prevent F rising above 9 kN, the foam must crush with a plateau stress of approximately: sc(0.25) = F/A = 0.9 MPa. Impact mitigation depends on the ability to absorb energy. By changing its image as strictly an emergency product, the rice can be enjoyed as a snack by people who have to work overtime or even as a regular meal. […] "Consumers are attracted to the portability, convenience and design of the products," said Nobue Suzuki, a consultant with Rakuten Inc. Sales of disaster prevention goods in general have been robust at Rakuten, with sales this year on track to rise about 40%. Awareness of the need to be prepared has increased, but relatively few households actually buy these items, said Sogo Service' Onuma. 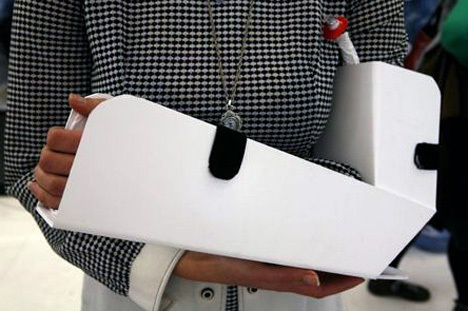 Companies are thus aiming to tap into wider demand by promoting their usefulness in daily life. [The] Japanese product is highly characterized by its miniaturization, due to the economic profit, resources limitation, traditional aesthetic and space limitation. 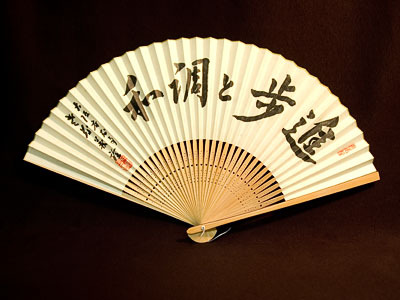 Small object designs have obvious traits and delicately communicate aesthetic senses of oriental cultures. The scale is seen as one of cultural traits of a product. In accordance with modern lifestyle of single, mobile, personal, compact, portable and growing multi-function products, most products require flexibility, integration, portability and multi-functionality. Therefore, designs of miniaturized articles are mainly for space-saving purpose. It could be divided into two parts: one is to shrink product scale aggressively with design formality for the saving of space; the other ... is to reveal ordered aesthetics passively to avoid the mess of environment. The Japanese helmet is also called a Kabuto, which was used with traditional Japanese armour as worn by the Samurai. The Kabuto has a strong bowl which protects the crown of the head and a suspended series of articulated plates to protect the neck. Often the Kabuto or Japanese helmet has a crest of the clan, adorned with "Maedate" (Front Crests,) "Wakidate" (Side Crests) or "Ushirodate" (Rear Crests). These can be family or clan emblems, or flat or sculptural objects representing animals, mythical entities, prayers or other symbols. Horns are particularly common, and many helmets sort "Kuwagata", or stylized deer horns. A Kabuto was usually constructed from 3 to over several hundred metal plates, riveted together. The plates are usually arranged vertically, and radiate from an opening in the top. Matches in waterproof container (include striker – facing away from matches, if not strike anywhere matches) or melt candle wax all over your matches beforehand. First aid kit with bandages, sterile pads and gauze, first aid tape, tweezers, surgical razor, disinfectant pads, oxytetracycline tablets (for diarrhea or infection) and aspirin. Also keep an extra pair of prescription eyeglasses or contacts. Any material in the kit that may be damaged or rendered ineffective by water should be wrapped or sealed in plastic. At least three days' worth of water (1US gallon – approximately 3.6kg) per person per day: two quarts for drinking, two quarts for food preparation/sanitation). Commercially bottled water is the safest and most reliable emergency supply of water, kept bottled in its original container and unopened. FEMA recommends replacing water at least once each year. Iodine or chlorine tablets for emergency water purification if boiling or filter not available. Table salt for food and also can be used for brushing teeth. Canned food, Ready-to-eat meals (MRE), or high-energy foods such as chocolate or emergency food bars. Hiking meals, such as dehydrated food, can also be used, but are not ready to eat – they require rehydration (water), but most are prepared in the bag rather than needing a cooking vessel. Canned foods heated in a closed can may explode. A supply of money in small denominations and coins in your kit helps for situations such as telephone calls (Where the lines still operate) or vendors selling various goods, both essential and non-essential. If living near national borders various currencies may be beneficial as well. Whistle – inexpensive and easy: blow into it three times, and rescuers will appear. Signal mirror – learn how to use it in advance. Chem light/glow stick – should come with a string. Tie it on and twirl the chem light in a circle; this signal is highly recognizable to aircraft. Tokyo Magnitude 8.0 is a Japanese anime television series that premiered on Fuji TV. The series' setting is based upon the prediction that there is 70% or higher chance of an earthquake measuring 7.0 magnitude on the Richter scale hitting Tokyo in the next 30 years, with the series illustrating the consequences of a 8.0 scale earthquake affecting the city. Bones stated that it would try to realistically depict the after-effects of such a situation and that it would collect and tabulate research on previous earthquakes and interview individuals who were affected by them. The series features the efforts of the Japan Ground Self-Defense Force, Tokyo Fire Department and Tokyo Disaster Medical Assistance Team in assisting recovery efforts after the initial earthquake and its recurring aftershocks. FNN newscaster Christel Takigawa also features as a guest, reporting on the earthquake and assuming the role of a "navigator" during the series. The show is centred around Mirai and her brother Yuuki who are caught in the midst of a strong earthquake and have to make the dangerous journey home. They immediately encounter Mari, a young single mother, who promises to guide them after a slight detour to her home where she hopes her daughter and mother are alright.